Have you wondered why did it take the Hainanese to invent such a simple food called Chicken Rice? The truth is boiled chicken is actually eaten in many places but it’s source is always credited back to Hainan. Like in Indonesia, steamed chicken is often called Ayam Hainan. Heck, there are a few billions people in Indonesia and they still need a Hainanese to teach them how to boil a chicken! It was said that, Hainanese usually can cook well. Not sure about the others but I definitely take pride in producing good food whenever I had guests. Hainanese can cook well because a lot of them came here as cooks onboard ships. So when they finally settled in this part of the world, obviously they are going to utilise the skills they acquired. And so a lot of them were in the food business which were ran by the whole family and that’s how you get the ‘good cook’ reputation with Hainanese. Traditional Hainanese Curry Rice at Old Airport Road Food centre is actually a family business. For those who are familiar with the Hainanese Curry Rice at Maxwell Hawker Centre, the man tending this stall is the brother. Therefore the taste is uncannily similar. I went with the pork chop, stewed cabbage and the famous Hainanese minced pork which are, apparently what the stall at Maxwell Hawker Centre is famous for too. The stewed cabbage was very good. The flavour found the right balance and went very well with the curry and rice. I should say it is very ‘Hainanese’. 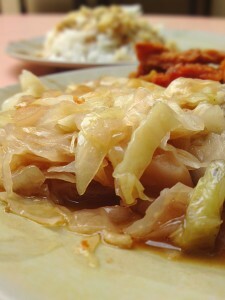 The difference between ‘Hainanese’ cabbage and others is that Hainanese cabbages seem to have been boiled before it is being cooked in some sweet sauce as oppose to those in chap chai peng stalls which is stir fried and more on the salty side. The thing about stir frying vegetables is that you lose that bit of volume even if you maintain the crunchiness. Somehow vegetables that have been boiled first taste better and because they are cooked already, it didn’t need to spend a lot of time in the wok so therefore can always maintain their volume. Though Hainanese cabbage is called stewed cabbage, I actually doubt it’s been stewed for long since cabbage would lose it’s ‘crunchiness’ after a while in the pot but stewed cabbage in a Hainanese Curry Rice stall always has a certain amount of crunchiness with good volume . I’ve ate at the Maxwell Hawker Centre’s Hainanese Curry Rice stall many times, so the flavour here is really something I can relate to. 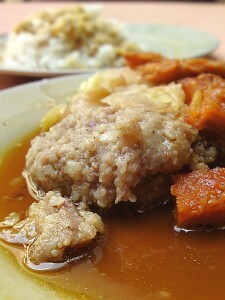 The pork minced is distinctively Hainanese style. It was just exactly how I expected it to be. More fats than meat, melt in your mouth effect and was a little sweet. Definitely as good as the one at Maxwell Market. A die die must order dish if you ask me. 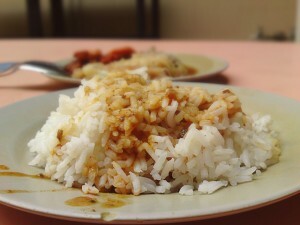 No plate of delicious Hainanese curry rice can be completed without it! The Hainanese Bak Pa or the pork cutlet(though it’s often referred to as pork chop) here is very similar to one at Maxwell Market too. It has a hint of that sweetness and is also orange in colour(not sure why) but really goes very well with all the other dishes and sauces. By itself, it may be nothing to rave but remember, that it’s not meant to be eaten by itself. Hainanese curry rice is all about mixing everything together and it may look like swill to some but it is seriously delicious to people who dare to explore beyond it’s appearance. 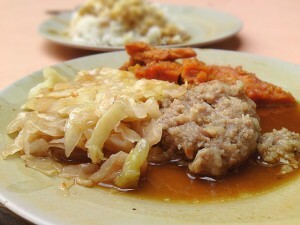 Recommendation: Minced pork, pork cutlet and cabbage. Some other dishes like fried potatoes are also good. Conclusion: This Hainanese flavour is something I can relate to. It has a good flow of sweetness through every dishes. The curry was pretty mild but nonetheless quite good to go with all the dishes. If you like your food to be a little sweet, you might just fall in love with this. Likes: All the individual flavours and tastes complement each other very well. Dislikes: Would be good if the owner invest in a good food warmer. 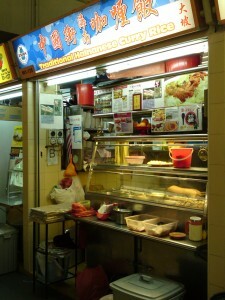 I’ve eaten a few times from this stall and the food is usually a little on the cold side. Wonderful review! I like Hainanese curry rice! I notice Hainanese curry is not too spicy hence suit my taste! 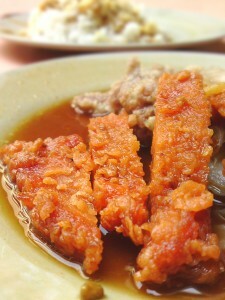 Being I stay in the west side of SG, I will usually had my Hainanese curry rice at Redhill Market or Maxwell market. What is the difference between Hainese curry and normal curry? Depends where you go, different places have different taste and flavour. Generally it’s thicker and sweeter.